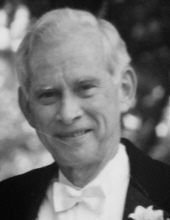 DURHAM: Robert “Bob” T. Simpson, 88, passed away on Sunday, January 13, 2019 at his home surrounded by his loving family. He was born in Rock Hill, SC to the late William Robinson Simpson and Elizabeth Truesdale Simpson. Mr. Simpson graduated from Duke University in 1952. He enlisted in the U.S. Marine Corps where he was a 1st Lieutenant. He served during the Korean War, and was awarded the National Defense Service Medal for Distinguished Service. Mr. Simpson later attended the University of North Carolina at Chapel Hill for graduate school. He served as the Associate Director of Duke Undergraduate Admissions, the Director of Admissions at St. Mary’s College in Raleigh. Upon leaving St. Mary’s, he started a private enterprise and worked until his retirement. In his free time he mentored and coached many kids through youth sports including St. Stephen’s basketball, undefeated for 5 years, Elk’s youth football teams and little league baseball. He was an avid Duke Blue Devil fan and he enjoyed following his grandchildren’s sports endeavors. Mr. Simpson is survived by his loving wife of 61 years, Sarah Wray Simpson; sons, Bobby Simpson and wife Heather, Billy Simpson and wife Melissa; daughter, Betty Harmon and husband Ted; grandchildren, Robby Simpson and wife Corey, Henry Simpson, Philip Simpson, Alex Simpson, Anna Ross Simpson, Carter Wray Simpson, Pride Simpson, Sarah McKinney Simpson, Macon Harmon and fiancé, Rod Mitchell, Abby Harmon; and great-grandchildren, Asher Harmon, Amelia Mitchell, Charlotte Toro; brother, Bill Simpson and wife Laura; niece Lauran Simpson and son, Josh. The family will receive friends from 5 to 7 p.m. on Tuesday, January 15th at Clements Funeral Home in Durham. A funeral service will be held 2 p.m. on Wednesday, January 16th at St. Stephens Episcopal Church with the Reverend Robert Kaynor officiating. Burial will follow the services in Maplewood Cemetery. Pallbearers will include Robby Simpson, Henry Simpson, Philip Simpson, Alex Simpson, Pride Simpson and William Parrish. In lieu of flowers, donations may be made to the Duke University Children’s Hospital: Office of Development, 512 S. Mangum St., Suite 400, Durham, NC 27701 or St. Jude’s Children’s Research Hospital: 501 St. Jude Place, Memphis, TN 38105. The family wishes to extend thanks to his two loving caregivers, Dessa Jones and Ashley Strong. To send flowers or a remembrance gift to the family of Robert "Bob" T. Simpson, please visit our Tribute Store. "Email Address" would like to share the life celebration of Robert "Bob" T. Simpson. Click on the "link" to go to share a favorite memory or leave a condolence message for the family.